The Pocket Shark by Cold Steel shares many features common to most markers, but appearances can be deceptive. 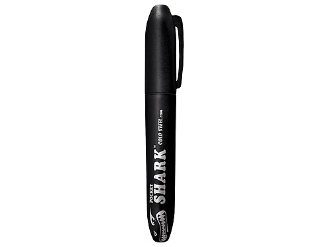 For starters, the Pocket Shark is made from high impact plastic and features walls that are 4 times thicker than similar markers. This means it's built for impact and, in a self-defense emergency it can be used as an efficient impact tool stick for driving off an attacker. Plus, the screw-top cap will stay in place and won't pop off like a regular marker's cap would when you strike a percussion blow, or when obtaining joint locks or submission holds. It's easy to carry. Just clip it to a shirt or coat pocket, or carry in your purse, pack or brief case.